Paavani | I think therefore I write! a monk who sold her camera. In essence of celebrating World Photography day– 19th august, I would like to share my perception on how monks & photographers are related. Monks are not simple human beings, they wear a peculiar dress and follow a set of rules. Just like photographers, they also observe extra ordinary in ordinary. Monks live an unconditional life and photographers try to give unconditional expressions via visuals. 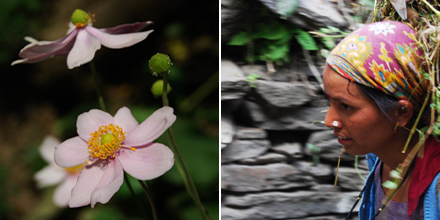 Monks change themselves from the very roots of his being and photographer present the things the way they want. A monk’s quest doesn’t end and a true photographer never gets tired of being hermit and rootless wandering habit to get her subject right. A monk gets peace when with God and a photographer gets solace with her gadgets which isn’t necessarily hi-fi. But just like having proper knowledge will lead a monk to a clearer route to God; proper equipment makes the findings easy for a photographer. But she can even do wonder with a mobile camera, and not necessarily a canon 5D mark II. And if you have questions regarding what photographers do whole day, just like a monk, a whole day is less to pray (play) with images. So enjoy this photographic journey my dear photographer friends, and wishing lots such photography day (events & exhibitions) in your life. Ps: it’s a pure religious post. A photographer relation with her camera and her respect hidden in photographs. Thank you. China is one country I wanted to visit from a long time. The thought started when I was in the design school, for getting easy and cheap prototype for my brilliant idea. The same persisted in 2008 August when I wanted to go to watch Olympic live. Finally, the same materialized in December 2008 as I got the chance to travel with one more country added to the Places-I-Have-Traveled map. Shanghai, the largest populated metro of world is somewhat similar to Mumbai. Busy fast life and tall buildings and so much lost in that fast pace. Maglev is just one example- a magnetic train runs from Shanghai’s Longyang Road subway station to Pudong International Airport at the maximum speed of 431 Km /H. Here cab system is also good, as long as you are careful to be able to explain to them that they have the meter on and running. People are very colorful in all senses – right from their clothes like colorful jackets, wrapped mufflers and colorful shoes to their colorful actions. One very interesting fact was to see the young people and teenagers holding their favorite gizmo (PlayStation mainly) and playing while having a 10 min ride either in metro train or bus. Getting vegetarian food is a challenge and I don’t count leaves as food. The problem gets compounded because of the language barrier – explaining something is real hard task. Even for non vegetarians, if you don’t eat beef or pork then choices are limited. But one must try Hot-Pot, it’s very nice especially on a chilly day. Be careful of timing- here dinner starts getting served from 5:30pm and get finished by 9:30 or so. So much to explore that words would be few so check the picture gallery. China’s capital that recently hosted the Olympic 2008, is really a city with a difference. On one hand, you have great structures like Great Wall of China, Forbidden Palace and Temple of Heaven and on the other hand, smell of awesome tea and herbal medicines attracts many to visit this city. This city has better signage system as compared to Shanghai. Of course lots of development happened in recent past to make it bit tourist friendly. You would definitely like the old monument and new structures like Water cube and Bird nest. For night out, you could try Kung Fu show at Red theatre. Its worth watching if you don’t have great expectation. If you are taking guided tour, she will take you to tea house, pearl market and where not. And if you don’t buy anything, be prepared for a cold look. I will end my blog with a line about The Great Wall – it’s really a wonder. We were awestruck with the grandness that it offered, it has taken humongous effort and has been well worth it – possibly more. After having a hard time at work, a break is very important. Not only does it help unwind, it also gives exposure to other parts of the country. 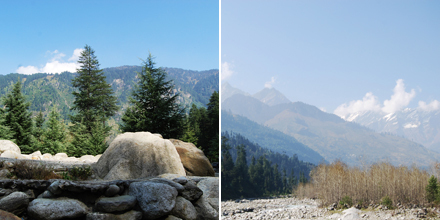 We also took a similar break, from the heat of Delhi to the cool weather of Himachal. Manali-Abode of Manu (Manu, who recreated the human) in Himachal Pradesh, India. 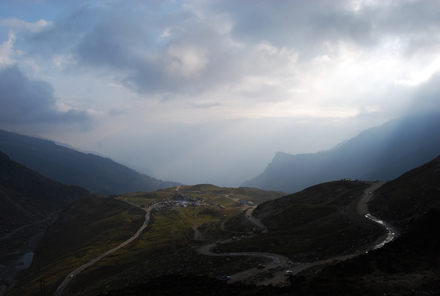 This town also has a way to Ladakh via Rohtang Pass. It’s a peaceful place famous for apple orchard and woolen shawls and nice cool excursions. We started our journey from New Delhi National Highway -21 via Panipat, Chandigarh and Kullu. Taking a Volvo bus has advantages as you could relax in the night, and you would be somewhere in Himachal when you wake up the next morning for having a cup of hot tea. You will reach the city shortly thereafter. We reached Manali at 11am and after check-in to our hotel (Manali heights, which we found very good) took brunch and cab to see city attractions. 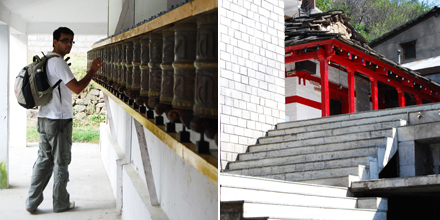 The local attractions, namely Club house, Tibetan Monasteries are just ok type. 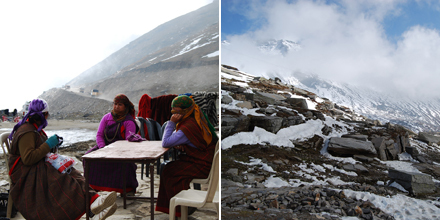 It is advisable to carry an extra pair of cloth, if you plan to go to Vashisht Hot water springs. Hadimba temple is nice specially for taking a walk around. It is apparently also famous amongst film-makers and we also witnessed shooting of a film when we were there. 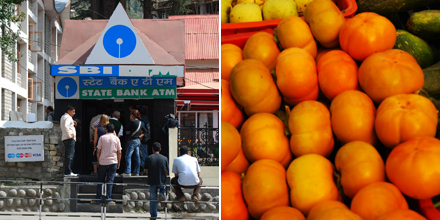 Manu temple in old Manali is also worth a check-out, to see old homes and walk down on narrow lanes. 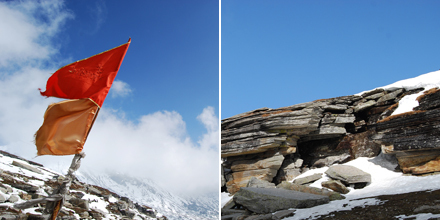 This place and its surroundings have loads to offer in terms of activities like para-gliding and skiing. 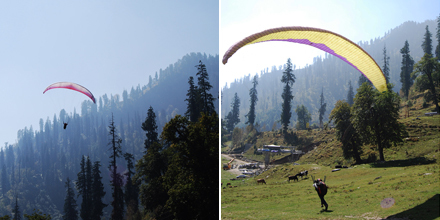 Solang valley is a must-visit place, do indulge in paragliding other than good sightseeing. And if you are on a long trip, just keep half day time solely for this so that you can do this from greater heights (3-4 hours activity in total). 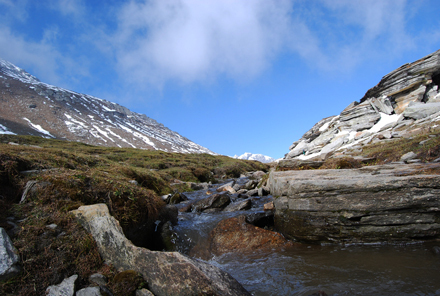 The road to Rohtang pass has lots of Nallas (or waterfalls) and you will like to stop there while driving on the broken narrow roads. Once you reach the destination, you can take a walk around, climb the snowy mountains or do skiing. Ginger tea and noodles is a good way to relax after a tiring walk. This place has small local shops for all these. Just beware of Kesar (saffron) and Kasturi seller, who will go all out to con you. When we visited, snow was there but not enough to really excite you (particularly if you have seen snow before). But it was more of wholesome experience, the journey that made it interesting. On the way back, some dynamites were kept to clean up the road and our cab stopped right before that, so that way it was bit real adventurous. While coming down, we stopped at Mandi (which is a small village) and saw sunset. And yes, before I forget to mention, I must advise you on keeping one day just to explore market and have lazy lunch at Johnson café or Casa Vella café. 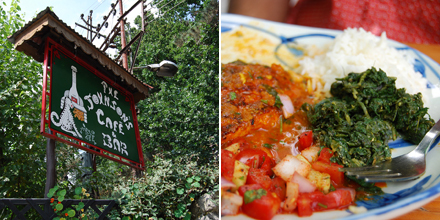 Both these places are highly recommended to have good food. Point to keep in mind- don’t buy Chingu (kind of quilt but it is all a fraud) though the locals have pretty interesting story about the same, don’t buy saffron (you can’t get 15gm for Rs. 100 anyway). Carry enough cash- there are just 2-3 ATMs and they hardly work. And yes, don’t forget to carry woolen clothes. It’s cold there in any season.